Friday afternoon, Jan. 16, news went out across The Last City and all regions beyond that Xur, Destiny’s mysterious weekend vendor, was selling the legendary sniper rifle known as Icebreaker. Arguably the best gun in the entire game, my mission was clear: I had to have it. To understand the tragedy of my tale, perhaps a bit of groundwork is in order. Destiny is absolutely overflowing with loot, but a select number of “Exotic” weapons make up the best gear you can get in the game. There are three ways that I know of to come by these firearms. For starters, extremely lucky Guardians might receive them as a reward or drop while going about regular in-game business. Secondly, and not quite as rare, you may receive special missions featuring loads of obnoxious objectives in order to “craft” one of the firearms for yourself. Finally, Xur—Agent of the Nine—offers a couple of firearms each week in his personal shop. The trick here is that Xur’s inventory is completely random and he’s only available for 48 hours each week, Friday through Saturday. I’ve played a decent amount of Destiny since the game launched last fall but, for some reason, my luck with Exotic weapons has been abysmal; by which I mean I’ve never received one. Not one. Not-damn-one. All of my friends, on the other hand, have multiple Exotic weapons and are working on multiple mission paths at once to earn even more. As for the third option, my reason for missing out on Xur’s goods all these months is simple: I haven’t had much luck with the currency needed (Strange Coins) to buy his guns and armor, either. The one time I had a decent pile of Strange Coins amassed, I used them to buy my first (and only) piece of Exotic armor. While you can have multiple Exotic weapons, you can only equip one piece of Exotic armor at a time. That, coupled with the hefty level bonus they offer, made me decide that armor was more important than a firearm, and thus my Strange Coins were spent. Then, last weekend, the unthinkable happened. Whatever crazy algorithm that controls Xur’s inventory decided to smile upon the masses, making the Icebreaker sniper rifle available for 17 Strange Coins. 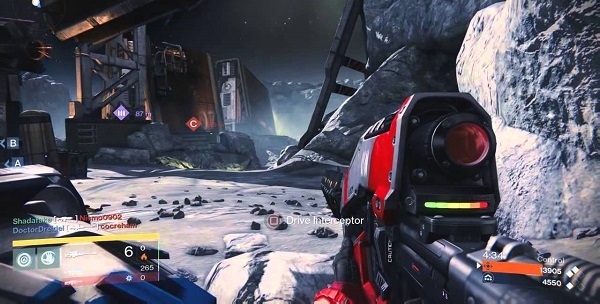 Before last weekend, this was the gun in Destiny that everyone was talking about. Terrific stats, massive damage and, more importantly, it has an ability that lets it regenerate ammo over time. Word went out instantly across social media and forums galore. It was such a surprise that game news sites even did briefs on it, encouraging anyone with the time and Coins to rush out and grab an Icebreaker of their own. I knew my time had come. I rushed home from work Friday afternoon and immediately booted up the game. Upon checking my inventory, though, my heart sank: One Strange Coin. I had less than 48 hours to earn another 16 round pieces of glory, which needed to be wedged between basketball games I had to cover that very evening and two reviews I needed to pour as much time into as possible over the weekend. And so, I got straight to work on what I knew would be a massive grind. My first order of business was to tackle a number of missions in order to level up my Vanguard and Cryptarch status. Doing either of these takes a bit of time but I wasn’t too far off from leveling up both of them, and their rewards have the potential to result in Strange Coins. I actually leveled up both at almost the same time and, to my surprise, it appeared my luck was on the upswing: One Strange Coin for each. Another way you can earn Strange Coins is to turn in Engrams; glowing loot drops you can get within the game that have the potential to turn into gear or various other items, including the Coins. 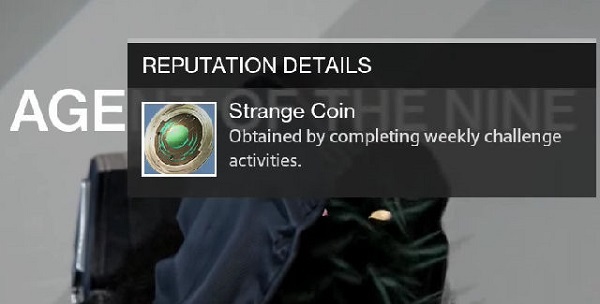 To my surprise, one of the Engrams I had just picked up also gave me a Strange Coin, bringing my total to four. By that time I had to get back to my regular job but, as soon as I got home late that evening, it was right back into Destiny. After an upsetting amount of bother, I finally managed to pull together a pair of extra players and we tackled the weekly Strike together, netting me an nine Strange Coins. That trick only flies once a week, though, so the rest was going to have to be earned purely on luck. One of our members explained that Strange Coins were often a reward for Nightfall Strikes as well, but we simply couldn’t manage to muscle our way through that extremely difficult mission before it was much too late and I had to go to bed. After I finished work on Saturday, it was back into the grind. I managed to get another group together and we tackled that Nightfall Strike twice. Each time I was awarded with a half-decent scout rifle, but no Strange Coins. One of my party members recommended I focus on public events and regular engram collecting, saying that he managed to rake in a load of Coins that way. And thus, I spent the next five hours (which really should have been dedicated to review time) taking on public event after public event, collecting engrams galore and rushing to the Tower to cash them in. I completed well over a dozen of those events and dropped off more than 20 engrams, but did not manage to collect a single Strange Coin in return. Looking at the clock, the deadline looming, I knew that I had been defeated. I did my best to pretend that it didn’t bother me too much, but I knew deep down that whatever cruel gods govern Destiny were having a good laugh at my expense over the past 48 hours. They’d gotten my hopes up, convinced me that victory was just around the corner, and then snatched it away from me at the last moment. And so, Sunday morning, the Icebreaker now well out of my reach, I booted up Destiny to play the game the way I typically prefer: Casually. My first mission netted me a single engram, which I dropped by the Tower to cash in before going on to the next activity. Only 20 minutes into my Sunday session with Destiny and with only one engram to claim, it of course turned into a Strange Coin. Yep, the gods were laughing at me.